Hi everyone I hope that you are all well and happy. Well its nearly here and I for one am getting VERY excited now. I just love to see peoples faces when they open there gifts I love myd that i have cr family being here on Christmas day I love everything about it ! For my post today I would like to share with you a card that I have created for my Husband using the FAB Naughty Santa digi available over at the Karleigh Sue Etsy Shoppe. 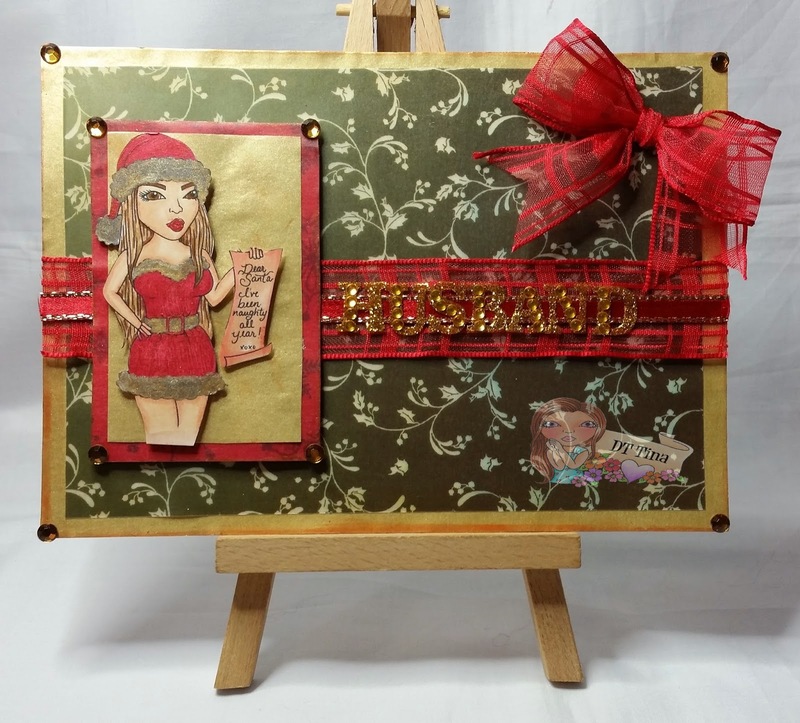 Base: 5x7 card blank from Papermania that I have layered with matt gold paper and holly pattern velum from my stash. Topper: Created from the same matt gold paper and red Christmas vellum and topped with the gorgeous naughty Santa digi that i have coloured with a selection of promarkers and copics. Embellishing: Wide sheer tartan style ribbon across the center of the card with HUSBAND in self adhesive gem lettering, big bow and dark gold self adhesive gems. Come along and join us over at the Karleigh Sue fan group for fun, chatter and freebies. We also have a group challenge on at the moment that has AMAZING prizes up for grabs Including a $25 Amazon voucher, digis and loads more so come join us for your chance to win!!! Another beautiful card Tina. Fluffy and I wish you a wonderful Christmas and hope that Santa brings you lots of lovely presents.